A couple of years ago, I sat down with my friend and fellow author Jake Antares. We brainstormed a novella about Ian Blake, a dutiful father of three and Philadelphia El engineer who loses his job in 2034 to automation. He’s forced to accept a new government basic income guarantee, because there are no jobs left for him to apply for. But Ian Blake is not the kind of guy who takes handouts. He’s not pretentious. He doesn’t consider himself superior to anyone else. He just likes to work for what he gets. He’s got moral fiber, like his German grandfather who was still plowing the fields of his Central Pennsylvania farm at age 93. 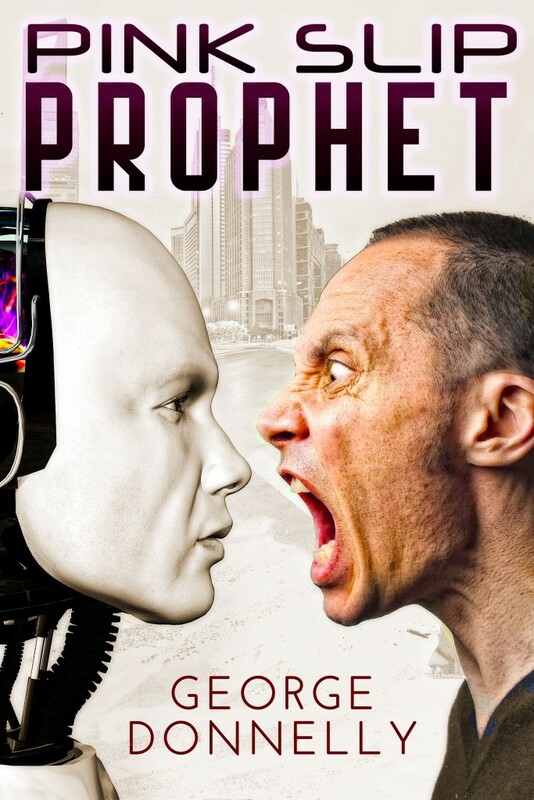 Add to that oil-and-water mix his spoiled kids, his nagging wife, his jealous ex-boss and his dream of building his own robot – and you get Pink Slip Prophet, a robot cyberpunk novella with a touch of comedy. I had a lot of fun writing it, finally, this past summer. Maybe you’ll enjoy reading it? No jobs. Robots took them. Citizens subsist on a basic income guarantee. They consume their lives in drug-fueled virtual reality gaming binges. Ian Blake doesn’t play games and he won’t accept handouts. He needs to be productive and useful – but his creepy boss just fired the baby-saving hero and father of three. Ian yearns to build his own robots now. But with a job offer in hand under his old boss in a government agency, he fights his family’s callous material greed and his own self-doubt to build the future he thinks we all need. Would you like to review Pink Slip Prophet? Email me for a free review copy.